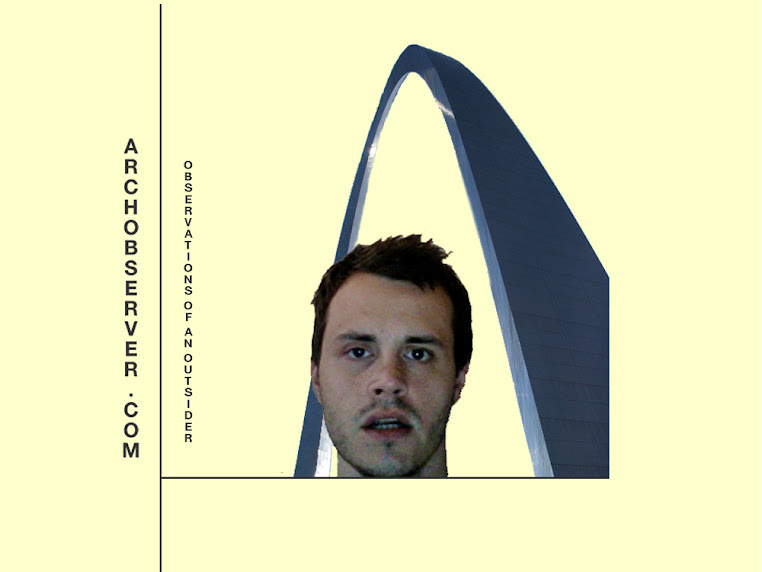 Arch Observer: Ted Drewes Frozen Custard: There's egg in it. I remember the whole frozen custard fade that swept NWI about 10? years ago. I'm with you on this one though, although I would never turn down a frozen custard, I would definitely not go out of my way to indulge on one. Ahhhh dang it. I meant to say fad... not fade. Fade is the type of haircut I love. I am a fan of the ted drewes ice cream sandwich... frozen custard sandwiched between two Dad's Oatmeal Cookies. This is my version of heaven. Also, for future reference, this custard fan prefers hers dressed is a sundae rather than a concrete. :) Happy Eating. I must say, Jim, that I love custard and you know that. But I would say that if I had never managed a frozen custard shop, eh em, Sheridan's which was not mentioned (don't worry, i won't hold it against you:) I would only be a huge ice cream fan. I have experience the apple pie concrete(blizzard) and enjoyed it very much! You picked a good one. Through out my years at Sheridan's, I did notice that St. Louisans love custard at all times of the year. I don't know if it's in the air, the way the moon lies, or just that we're all crazy b/c we like an ice cold treat when it's zero degrees. Either way, custard does have egg in it, and maybe that's what makes it sticky? If you're ever in the Indianapolis area, try Ritter's frozen custard. They offer (last time I counted) 32 different flavors. Oh... and just fwiw, Ted Drewes sells nice Christmas trees. Where else can you get a Christmas tree and an apple pie concrete at the same time? awwww, name recognition??? wow, I feel touched jimbo! I am glad I was able to pop your STL custard cherry! 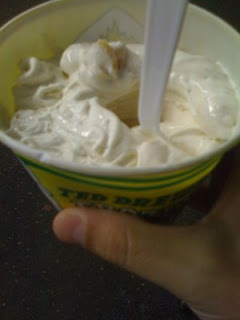 But never ask me to go again...I can handle Mr. Wizzards or Fritzes, but Ted Drewes is not my cup of tea! I can only say that and get away with it as I am not officially from STL!! I live right behind Ted's, and probably go there too much for my own good. I'm a fan of the banana chocolate concrete with pralines mixed in. I also love the Big Apple and during fall they have one with a piece of pumpkin pie mixed in. I def like regular ice cream alot too. I like em both. I don't like people throwing their empty bowls on my lawn jockeys head. That's happened quite a few times. You should try the tiramisu sundae. I have no idea what is in the topping, but it really hits the sweet spot. I either get that or a raspberry chocolate chip concrete. You should give the gelato place on South Grand a try. It works much harder than lazy frozen custard. As I understand it, Ted Drewes was the (or at least one of) first stand to develop the "concrete." DQ was located in Illinois and stopped by to see what the fuss was about, and thus came the "Blizzard." Alton Brown did a spot there in his first season of "Feasting on Asphalt." Worth checking out in my opinion.